Last night, news broke that Donald Trump tried to have special prosecutor Robert Mueller fired in June—about a month after he took over the Russia investigation. Trump cited three conflicts of interest, including an alleged dispute over membership fees at one of his golf courses. He actually issued the order, but White House counsel Donald F. McGahn II refused and threatened to quit. McGahn made his case to White House officials, and Trump backed down. Mueller has known about this episode for months, and it may end up being a critical part of his investigation. Obviously, this is a huge story, and many have called it a clear case of obstruction. On the cable news networks, it was the lead story. Yup—while CNN and MSNBC were getting to the bottom of the Mueller case, Fox News was doing some weird race baiting thing about Obama…a man who is not president anymore. 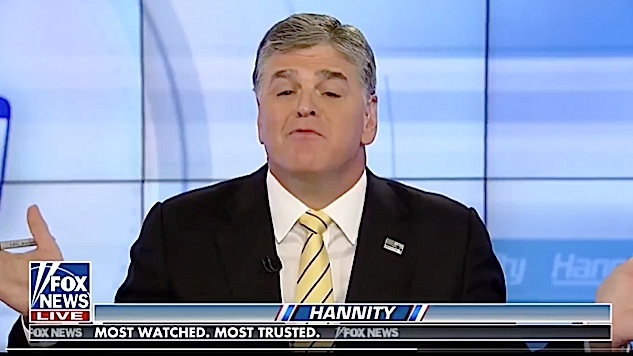 Sean Hannity: The New York Times is trying to distract you. They say Trump tried to fire Mueller, but our sources aren't confirming that! Why on earth would he add the green? Why? What that means, at its core, is that they're afraid Trump will say or do something incriminating if he talks to Mueller, and they're laying the groundwork to try to cover his rear with the American people when it happens. It's “protect the president” 101. Nothing to see here, folks!